Smaller companies are known for higher risks, but higher returns. In broad bull markets, small cap companies generally lead. This year, that has been half true. Leading investments in 2013 are concentrated in anything yield (from junk debt to utilities) and low volatility consumer staples. Following these winners are smaller stocks and midcap indexes. 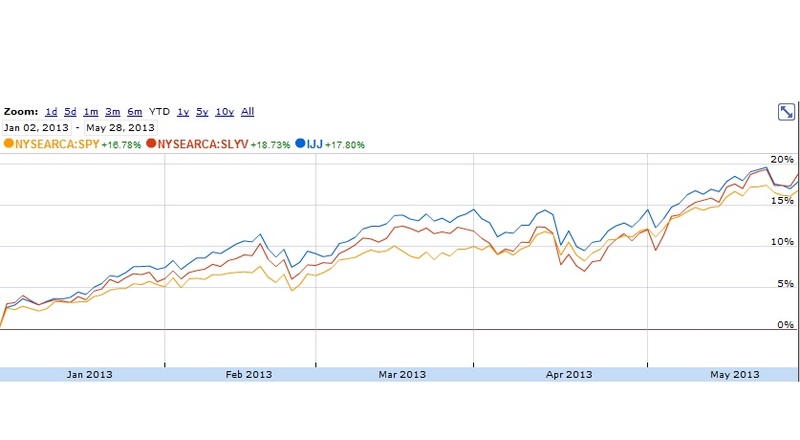 Last year I thought investors would benefit from a shift to small cap stocks in 2013. 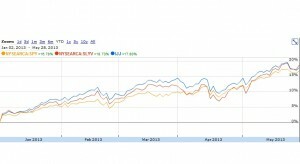 So far, the outperformance of smaller stocks is fairly negligible. Two previously recommended funds, SPDR S&P 600 Small Cap Value ETF (SLYV) and iShares S&P Midcap 400 Index (IJJ) have bested the S&P 500 (SPY) by less than 2% this year. Small and midcap companies benefit throughout the business cycle. Marginal revenues mean more SG&A leveraging on income statements, cheap financing makes it possible for companies to lever up, and their digestible sizes make smaller companies targets for acquisitions at big premiums. With a raging bull market in play, billions of new share repurchase authorizations and a thirst for equity exposure is pushing up valuations in “safer” stocks. Investors will have to go smaller to find more compelling valuations. Equities are on a tear, but there’s no clear “risk-on” trade underway when the leading sectors are those which are the most predictable and reliable, like utilities and consumer stocks. Small caps are the next trade as the risk trade turns on. The Wall Street Journal reports that smaller companies, which generate a larger share of their earnings in the United States, are projected to grow earnings at a 12-15% pace, according to research from Bank of America. That’s twice the expected growth of large cap earnings. iShares S&P Mid-Cap Value ETF (IJJ) – Utilities are more heavily weighted in mid cap funds than small cap funds due to their scale. This fund holds utilities at 10%, while allowing investors to participate in lower valuations in the financial space, investing 28% of the fund in financial firms. Industrials and information technology follow at 16.5%, and 10.5%, respectively. The fund’s average market cap of $3.5 billion ensures that investors are buying the smallest of the mid cap companies – companies that are small enough to be the target of new acquisitions. A bet on small and mid capitalization stocks is a bet on the United States. As housing prices recover, low interest rates fuel consumption and investment, and rising economic activity drive down the US budget deficit, a bet on the United States seems like one of the best the world has to offer. Granted, interest rates on the 10-Year Treasury have spiked recently driving mortgage rates up (latest mortgage quotes), but we’ve seen small spikes like this before and they’re still near historic lows nonetheless. It is probably best to check with someone who has completed an online mba degree for advice before investing. Previous post: Market is Up for 18 Straight Tuesdays – Investing Strategy?